DO-90205-22 was succesfully added to your cart. Ideal for measuring temperature from a distance. The accuracy of this thermometer is ±1.0º C. Please call our application specialists for suggestions on an alternative thermometer. I need to monitor the min and max air temp in an exhaust duct over a 24 hr period. will this device work? Will the battery last 24hr of continuous use. how long will min and max temps remain in memory, until over written and/or battery dies? The battery life for this model is approximately 1 year, depending on use. The memory lasts until the battery dies. Is the wire on this product waterproof too? I need something that I can submerge in up to 5 feet of hot water for up to two hours. Will the probe work within a thermo-well, or does it need to contact the media being measured? I believe that if you fill the thermowell with sanitizer, the thermometer will work. This probe is a thermistor, it has to be in contact with the media being measured. In order to use a thermo-well, a bimetal thermometer is needed. I have purchased this product before, but cannot remember if the thermometer comes calibrated (with the small calibration sticker attached to the cable) or if this is in addition to the base price. I see that "NIST-Traceable Calibration; Bimetals or Pocket Digital Thermometers" is offered as an extra service. Is this just for re-calibration purposes? When the calibrated product arrives, how long is the calibration valid - 2 years? I remember something like this previously. This thermometer is sent out with a certificate of calibration. It can be re-certified using 17003-00. Annual re-certification is recommended for these thermometers. Is this probe made of stainless steel? I need this for a food-grade setting. If not, can you please direct me to a calibratable weatherproof thermometer with a probe that IS stainless? The probe included with this unit is in fact made of 304 Stainless steel. This is exactly what I am looking for, except I need a little higher temperature range. Could you suggest a product that could withstand an environment of 80 degrees celsius at a depth of 12-18 inches of liquid? 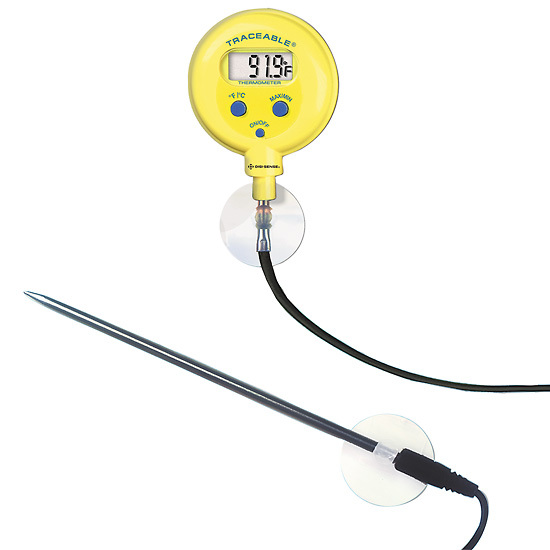 Although this meter is a thermistor-type thermometer; you could consider using a single input type 'T' thermocouple meter (item 91427-20) with a heavy-duty 24" stainless steel probe (item 93756-44). what is the commercial battery type so I can procure locally as I only need one. This products uses an A76 button cell. Does this Unit have a settable alarm? I'm looking for a until like this that also has an alarm that would sound if the temp rose above 90F. This thermometer does not have an alarm. Look at our 90052-00 which has an audible alarm when the set point is reached with a waterproof remote temperature probe. Mount the display outside the oven and insert the probe inside to measure the hot zone. What is the temp rating of the cable for this product? The cable has a temperature range of 0-50C. This gauge is exactly what we needed. Durable, accurate, and weatherproof . Stands up well to the elements. Perfect for the price and my needs. It's easy to keep clean and the long cable comes in handy. The only shortfall is that it is difficult to read at certain angles in dim lighting. Love the quick response time, and easy change from degrees C to F. Waterproofing already came in handy. We are using the temp gauge to monitor influent temperatures in the flue at a sewage treatment plant. It's always ready to check temps and so far has been completely resistant to being immersed continuously. There were no instructions to suggest to remove the battery cover and the plastic strip. I almost sent it back as a non-working unit. It will be great to measure the temperature of the wine during fermentation. Previously we could not read the dial four feet down in the tank.